Pioneer Park’s newly installed disc golf course in Quincy — a challenging and affordable all-season sport that is open to players of all abilities — is proving to be a big hit with local sports fans. “Our disc golf course is up and running and people LOVE it!” General Manager James Shipp told the Central Plumas Recreation and Park District’s board of directors at its regular monthly meeting Oct. 31. Attending the board meeting were members Rick Leonhardt, Jeremy Pilkington, Jerry Sipe and board chair Laurie Sturley. The rec district’s new course is set up within the sparse stand of trees beside the popular skate park off Fairgrounds Road and Highway 70 in East Quincy. Play is open anytime, no reservations are necessary. According to the Professional Disc Golf Association, disc golf was formalized in the 1970s and the sport shares the same joys and frustrations of traditional golf in terms of building skill to sink a long putt or potentially hitting a tree halfway down the fairway. However, there are some differences. By design, disc golf can be enjoyed by people of all ages and is played much like traditional golf. Instead of a ball and clubs, however, players use a flying disc or Frisbee. Players shoot for par by using flying discs called drivers, midrange discs and putters to throw from a tee area to a target and land in the basket, or “hole,” in the fewest number of throws. Once the “putt” lands in the basket, the hole is completed. The most common type of basket used is an elevated metal basket called a Pole Hole, which is what the East Quincy course features. Players progress through the fairway by making each consecutive throw from the spot where the previous throw has landed. Natural obstacles like trees, bushes and terrain changes provide challenges for each golfer. 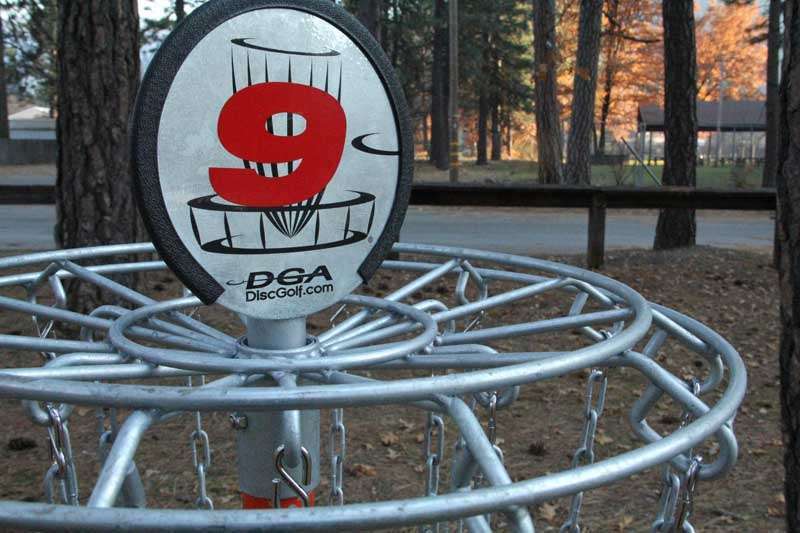 The PDGA maintains that disc golf offers year-round fitness, even in rain or snow. There are currently more than 5,000 courses in the U.S. and most of them are both open to the public and completely free to play. The sport is also affordable. The PDGA estimates a professional quality disc costs less than $15 and it only takes one for basic play. In other business, the rec district board members began considering repair options for Lowell Bader Park, located in Meadow Valley 6 miles west of Quincy on Bucks Lake Road from. The park suffered substantial damage in last winter’s severe storms. No action was taken at this time and discussions will continue into the next few months. Lowell Bader Park is the smallest and most rustic park in the Central Plumas Recreation and Park system. The park features a tennis and basketball court, horseshoe pits, a playground for smaller children, individual and group picnic/BBQ facilities and a large play turf area.